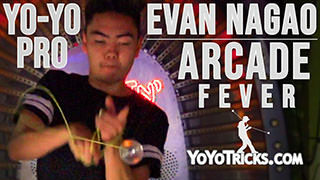 Learn how to do the trick Barber’s Pole from US National Champion Evan Nagao. 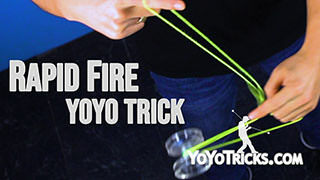 The setup for this trick is very similar to Mach 5, so if you have not already learned that trick, go check out that video. And we will get into the trick. So you start off throwing a Split Bottom Mount. Then just as you would with Mach 5, you are going to bring your non throwhand around. You are going to get into the Mach 5 mount. 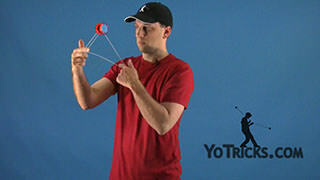 Make sure that the strings are vertical and that your throwhand is above your non throwhand. From here, you are going to rotate and swing the yoyo around the front of the string towards your non throw side, like so. You are going to go around two or three times. 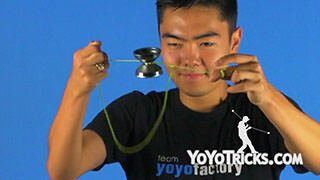 Then go around another half rotation so that the yoyo ends up in front of the string. 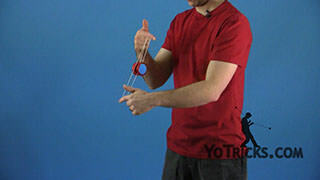 Then just as you would in Mach 5, you are going to bring your throwhand in front of the yoyo and your non throwhand behind the yoyo so that your hands switch positions and the yoyo is on the side of the string closest to your body. Then you are going to keep rotating the yoyo around the same way you were before, in front of the string and towards your non throw side, until it completely unravels. 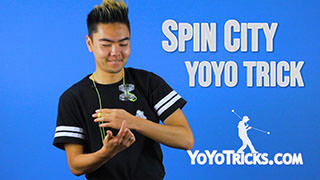 Then you are going to roll the yoyo forward onto your index finger of your throwhand. That should bring you back into a Split Bottom Mount. 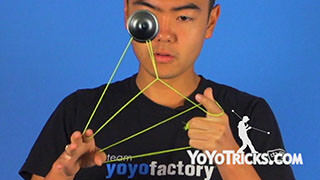 From here, you can drop the mount and bind the yoyo. If you are having a tough time learning this trick, some tips I can give you: First of all, is to make sure that the yoyo stays in the center of the string, not too close to your non throwhand or to your throwhand. Just right there in the middle. 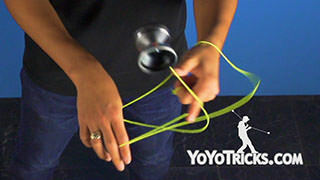 That will allow the yoyo to rotate a lot better. 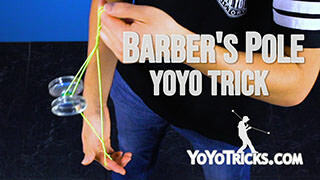 Another tip I can give you is when you are practicing this trick, start off by just learning it slowly. 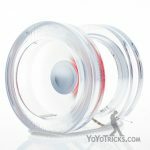 Then as you start practicing and getting more fluid, you can do the trick a lot faster. 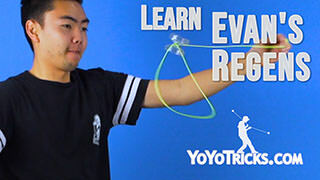 The final tip I have for you is that as you are starting to get faster with the rotation, you want to practice pulling tightly on the string. 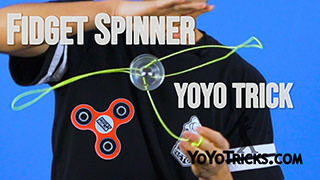 But, not too tight that the yoyo completely stops in place. 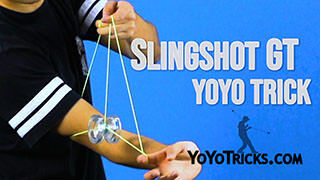 Also, if you are pulling too loose, you will notice that the yoyo will actually either fall off the string, or get tangled. So once you get the trick down, you can try instead of going into the Mach 5 mount, just going directly into the rotation. 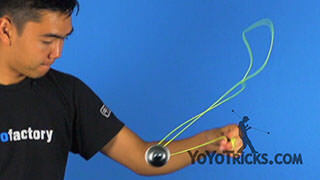 This will make the motion look smoother and the trick will look better. 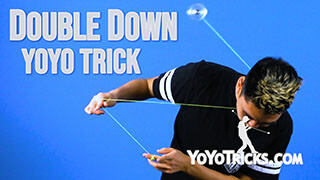 You can also try adding some variations on this trick. 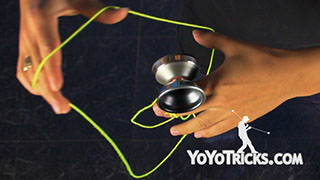 For example, you can rotate the yoyo the opposite direction. Or, you can go sideways and do the trick that way. 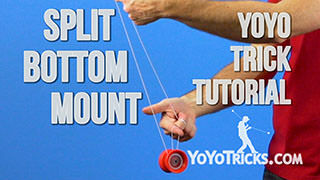 You can also add it into combos. For example, you can put a Mach 5 at the end, or you can do Pop N’ Fresh. So, have fun with it, and that was Barber’s Pole. So have fun with it, and that was Barber’s Pole. (And, Cut!) Guys, seriously, like, I need a haircut. I feel like it is just so long and I feel like people are judging me for it. Like, honestly. Chris: I mean if you want, Evan, I can cut your hair for you. Evan: Dude, you do not cut hair. Chris: Yeah, I went to cosmetology school, I have got a degree in hairstyling. Evan: Bro, I do not believe you, you can not, you can not cut my hair. 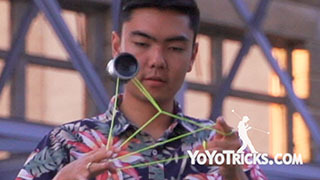 Chris: Evan, how could I do this trick if I did not have a degree in cosmetology? Evan: Oh, oh, ok, yeah, let’s go do it, yeah, ok, alright, yeah.